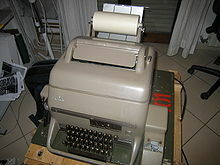 Teleprinter T 1000 electronic teleprinter (processor based) 50-75-100 Bd. Teleprinter T 1200 electronic teleprinter (processor based) 50-75-100-200 Bd. ^ RTTY Journal Vol. 25 No. 9, October 1977: 2. ^ Foster, Maximilian (August 1901). “A Successful Printing Telegraph”. The World's Work: A History of Our Time II: 1195–1199. http://books.google.com/books?id=IF6tNZnhO7wC&pg=PA1195 2009年7月9日閲覧。. ^ a b Colin Hempstead, William E. Worthington (2005). Encyclopedia of 20th Century Technology. p. 605. http://books.google.com/books?id=0wkIlnNjDWcC&pg=PA605. ^ a b Huurdeman, Anton A. (2003). The Worldwide History of Telecommunications. Wiley-IEEE. pp. 302. ISBN 0-471-20505-2. ^ Colin Hempstead, William E. Worthington (2005). Encyclopedia of 20th-century technology. p. 605. http://books.google.com/books?id=0wkIlnNjDWcC&pg=PA605. ^ Earle, Ralph H. (1917). The Morkrum System of Printing Telegraphy. Chicago: Armour Institute of Technology (thesis). http://www.archive.org/details/morkrumsystemofp00earl. ^ Adjustments, Type Bar Page Printer, (Model 15). Chicago: Teletype Corporation. (1941). オリジナルのDecember 5, 2010時点によるアーカイブ。. http://www.webcitation.org/query?url=http%3A%2F%2Fwww.bitsavers.org%2Fpdf%2Fteletype%2F138_Model15_Adj_Oct41.pdf&date=2010-12-05. A.G. Hobbs, G8GOJ; E.W. Yeomanson, G3IIR, A.C. Gee, G2UK (1983). Teleprinter handbook (2nd edition ed.). RSGB. ISBN 0-900612-59-2. Foster, Maximilian (September 1901). “A Successful Printing Telegraph”. The World's Work (New York, NY: Doubleday, Page & Co.) II (5): 1195–1200. http://books.google.com/books?id=IF6tNZnhO7wC&pg=PA1195 2012年4月29日閲覧。. 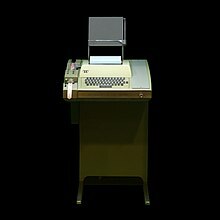 "Some Notes on Teletype Corporation"